We've all seen this scenario in movies; somebody has to cross a room half filled with water and there is a dangling electric wire that shoots sparks everywhere. 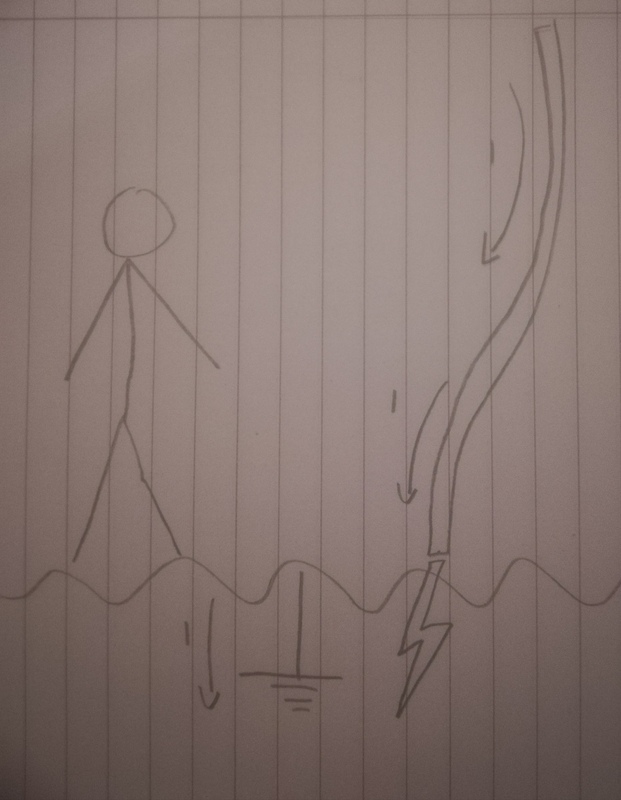 The poor person has to cross the room but cannot do so because if the wire hits the water he is obviously electrocuted since water is a conductor. But is it so simple in real life? If I'm really standing in water in a room, and a high voltage wire hits the water, how does the electricity flow through me to electrocute me? Only my feet are touching the water, no other bodypart of mine is touching anywhere. And realistically there probably would be some piping etc. connected to ground somewhere that would conduct the current to ground. How would I be electrocuted if the current just flows past me? I suspect this is similar to the well known situation of somebody dropping a hair dryer into a bathtub with a person in it. Why doesn't the current in this situation flow either from the live wire to the neutral wire or through the drain to the ground? Why does simply being in "high voltage water" electrocute me? (And yes, I know the scenario is not so likely with modern appliances but let's consider this in theory). Oh yes. The phenomenon is called "Electrical Drowning". In this tragic case, a girl decided to dance in a fountain, unawares that the underwater lights had a ground fault. Her muscles contracted and she fell down. One friend went in to try to grab her, and she too lost control of her leg muscles and fell down. Her two other friends tried to rescue the first two. Firefighters showed up, one tiptoed in, lost it and his friends yanked him out. The firefighters spent 15 minutes trying to find the shutoff switch. The problem with falling down in water is that you drown. All four girls did. In fact, multiple victims is often the only clue to an electrical drowning. This is why any beachside installations now require GFCI and shutoff switches, and why you should not swim near a boat on shore power. You've seen problems involving grids of resistors. That's what water is, a 3-D grid of resistors, and you also are some of the resistors. Electrical current travels all available paths in proportion to their conductance (1/resistance). 1-10 mA is enough to start causing problems for a sensitive person; 100 mA is lethal in its own right. Electricity wants to get back to source (the pole transformer's neutral), and the NEC standard for a grounding rod is 25 ohms. You can do the math here. Well, I get 120 V through a 24 ohm resistor = 5 amperes. So only a tiny fraction of that current need go through you to nail you. If we rely on that article's 20 mA, then 1/250 of the current is enough to drown you. Note also: this is not nearly enough to trip a typical 13, 15, 16 or 20 A branch circuit breaker. However, a GFCI breaker will trip at 6-8 mA. That greatly improves the prognosis. This narrows it down to a highly improbable combination of events where the current is naturally limited to less than 6 mA, and almost all goes through you, and you're ultra-sensitive. In something like water electricity does not "flow to ground" in a neat straight line. There is a potential difference between sections of water radiating out from the HV contact point. That might also mean that your feet are at different potentials, and there will be current flow which could be fatal. This is one reason why cows in fields can be electrocuted by a nearby lightning strike. The voltage difference between their feet can be thousands of volts. I think that the answer is pretty simple - you are a better conductor than fresh water. I read this somewhere and it made me giggle then: "Humans are just big bags of salt water", which is true. A current of 1 mA through the heart is enough to cause a heart attack, so at 220 V, 220 kΩ resistance is not enough. You are less than 220 kΩ, especially when in water. Skin is the only insulator we have. how does the electricity flow through me to electrocute me? Electricity doesn't flow along a single preferred path, it flows in the entire water body with different intensities. If you happen to be in a path with high enough current, you'll get electrocuted. An interesting corollary to this fact is that you'll get the worst shock when you and the water have comparable conductance. If the water is much more conductive than you, even high currents will only create a small voltage difference, which may not be harmful. If the water is much less conductive, the voltage difference may be huge, but the current will be limited. Just being in "high voltage water" won't electrocute you, just as birds can happily perch on 10+kV power lines (and linemen can be dropped onto live lines for maintenance work), since there's no path, but as you say, there's always going to be a path to ground somewhere in that water, and so there'll be currents flowing through the water. Since that means that there's potential differences across the water at different points, you'd experience that between your feet, and since the human body is a good conductor, other than the skin, which reduces greatly in resistance when wet, that would allow possibly lethal current to flow through the torso. People can and do get electrocuted standing in salty bilge water on 24V systems on boats, it doesn't take a lot of voltage if the resistance is low enough. Overcurrent and other fault protection: In most of the world, every circuit has over current protection and many circuits have ground fault or arc fault protection. As manufacturing capability increases, we've been able to add more ways to protect electrical installations and make them safe. In a futuristic scenario with improved technology, there is usually no reason this would have changed. Faults damage equipment, so even in a scenario where disregard for human life is written in, systems would have advanced precautions to limit property damage. At any rate, often the conductor you see creating the danger is actually a cable, with visible wires sticking out of the end, whatever the prop department thought would look cool. In many of these cases, the conductor, as presented, would have shorted between it's own conductors and tripped its overcurrent device or GFCI. In order for the conductor to stay live, something else must go wrong, like it miraculously not shorting out when being pulled loose from what it was connected to, falling, and or jiggling without shorting out on itself or touching something made of metal, or the breaker welding closed(which does occasionally happen). Electricity flows more on paths of less resistance. You could place large copper wire, a wet log and a strip of asphalt side by side, and connect the same voltage at once to the ends of all three. Most of the current would flow through the copper wire, much less would flow through the wet log, and a negligible amount through the asphalt, though there would be current flow in all three. If the conductors on a broken cable have enough voltage to create CGI arcs to nearby fixtures/water/whatever things that are far away, they have enough voltage to arc to its own return conductor or ground, which is sometimes mistakenly portrayed as inches away. For its own return conductor or ground to not be the target of most arcs, a second thing has to go wrong. Those conductors have to be broken somewhere between the arcing cable and the source, somehow without damaging a single high voltage cable more than would allow it to function. Electricity will not tend to travel through a meter of air to establish an arc when a 20mm arc establishes a low impedance return path. Electricity is often much more brutal and much less flashy than in the movies, and movies often portray a greater(or smaller) margin for survival than actually exists. As part of your training in electrical industries, especially in power distribution, there's a good likelihood you'll see a video of someone dying working with or around electricity. It's utterly terrible. Brutal, merciless, and not always quick. The actual speed that electricity can "change" and propagate at is fast enough to need quality examples to make it easy to comprehend. There are situations where high voltage is portrayed in movies as something that great dexterity, strength and skill can just deal with, and inevitably characters are sometimes shown doing something that would have killed or vaporized them. Sometimes with low voltage wires a character is shown killed by something that, as presented, would have a relatively low probability of being lethal. In the latter case I'm comfortable with that as laymen and professionals should treat something with a very good chance of killing them as something that will. Electricity flows in loops. Each molecule, depending on bonding, nuclei, and electron shells, tends to keep roughly a certain amount of electron in each area around it. The electrons themselves are bouncing around, and when they are not held too tightly where they are, they fly freely between nearby molecules, and the limiting factor is that when/as an electron moves out of an area that "needs" an electron, forces will be exerted on other nearby electrons as well as the one flying away to pull them in and fill the gap. Depending on structure of molecule and nuclei, different materials either bind their electrons tightly(insulators) or allow them to flow more freely(conductors). When you cause electrons to flow along a wire, new ones must replace the ones that flow away. The area you are pumping the electrons to will have too many and the area you are pumping them from will not have enough. There is nowhere for the flow to go other than back to where there are too few, as all of the other molecules around have exactly enough. No loop, no current. Water isn't really a good conductor. Dirty water, particularly salty water is. Pure water is not (tap water is not pure). Aside from that, if you put a generator on the shore of an ocean and strung a wire across the surface of the water to a point far out where the tip of the wire was bare, 1 meter underwater, and connected the generator to that wire and a ground rod, the generator would work to pass a current down that wire, into the water, along the earth, through the ground rod, and back to the generator, where the electrons you're pumping out need to be replaced. Because of the high(ish) conductivity of salt water, there wouldn't be high voltages/currents for too high a distance in most directions around the tip of that wire, as the flow of electrons is "attempting" to return on the shortest path possible to its source. voltage will spread out in other directions somewhat as the flowing electrons spread out to travel more freely. This is not to say that the water around the electrode is not dangerous, but to point that movies are often not specifically accurate with where current is flowing. Flashy arcs and sparks - Electricity is invisible. All we can see are the effects on objects as electricity passes through them. Heat, light, motion, the occasional smell. In order to draw attention to them, arcs, sparks and flashes are often brighter than they might be in real life, or of the wrong type (explosive rather than plasma, for example). The resistivity of air is around 2100V/mm, meaning to start an arc through room temperature air, you need 2100V for every mm you want the arc to jump. Once the air starts conducting and becomes a plasma, it conducts quite well, but it takes quite a voltage to start an arc. You are electrocuted when a current of more than 100 mA flows through you. The wire does not do the electrocuting, it only connects you to a current source. If there is no current source, there is no current. So go ahead and grab that wire. Nothing will happen. On the other hand, if the wire is connected to a current source, like the 220 VAC power to your clothes dryer, you are likely to die. There is nothing magic about a "dangling" wire. If the wire is rigidly supported, it will kill you just as dead as if it were dangling. To determine if the electric field inside water that is conducting can kill you... that requires a 3 dimensional finite element analysis of the voltage distribution within the body of water. If the wire is hot and is touching the water, you best stay out of it. On the other hand, near the edge of the water, where it is very shallow, the current will be minimum. So you might stick your toe in and see if you can feel anything before proceeding further. You can increase the lethality by adding ions to the water. Salt will do this, or any strong acid or base. Some utility wires are not wires at all and carry no current. They are fiber optic cables and are harmless. But don't bet on it. How do I “cap” a wire so it doesn't short or electrocute someone? How does a “break” in the neutral wire enable it to reach the full line voltage? 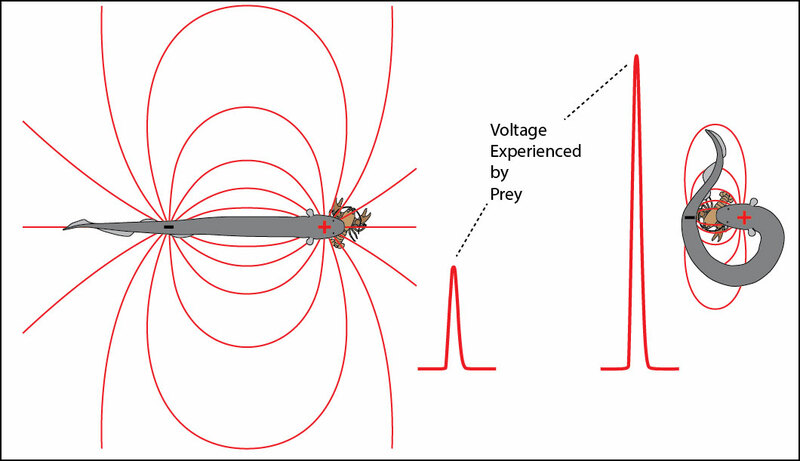 Can a charged 120v high voltage capacitor really kill you? How does grounding the circuit provides safety? Water on Li-Ion battery fire: good idea, bad idea, or neutral?